My story starts on 22 November 2005…. Out of the blue I had a seizure at 7am in the morning. After 10 days recovering in Maitland Hospital, itwas considered an isolated seizure – probably never to happen again. Unfortunately that was not the case. I had another one at home and then I got slowly sicker – eventually arriving at the John Hunter Hospital. I lost my speech – apparently I talked in “gobblygoock” – thinking I was talking normally – I couldn’t understand why people did get me! I lost the use of my right arm, and like a stroke, I dragged my legs. I left John Hunter Hospital using a walking frame. My diagnosis was Encephalitis. I was admitted to Maitland Private Hospital for rehab. I was in Maitland Private Hospital for six weeks – nearly 7 weeks. I had intensive speech pathology, O.T and Physio. Slowly the headaches from the swelling in the brain receded – I remember the day I woke up without a headache! It was a big breakthrough! For six months I recovered well. I was very fit following so much physiotherapy. I was active, walking and using anexercise bike every day. I was quite trim! nother lumbar puncture (I had 4 in total) and more physio! An MRI showed beading in the flow of blood to the brain vessels. Dr Blackie consulted Dr Levi, the specialist Neurologist on Vasculitis. He confirmed the diagnosed of CNS Vasculitis. After that I was put on a high dose (60mg daily) of steroids. I sat and stared. I did not cope. My appetite increased incredibly – I could not be fed enough! Over time I gained 23 kilos! That caused me embarrassment – I had to get a new wardrobe of clothes to fit my new figure. Over the next 16 months the steroid dose continued to drop to a new maintenance level (8mg daily). The latest MRI in July 2007 didn’t show much change, so at this point; Dr Blackie decided to introduce the drug – Methoblastin (R). I have to have a blood test every month as Methoblastin can cause liver damage. I took two tablets once a week – Wednesday was “Toxic Day”. We were not able to touch the tablets without gloves – they are very strong! I had to drink a lot of water on “Toxic Day”. I have ongoing problems – visual disturbances which causes what I call “flickers”. I have spatial problems – dropping food between my spoon and mouth! I have lost the lower right hand quadrant of my peripheral sight in both eyes – from a stroke. I will never drive a car again – something I really miss! 2007 was a time I grieved for my past life. I would throw a tantrum out of frustration – I was having trouble regaining lost skills; re-learning thingsI thought I should be capable to do! In February 2007 I joined Maitland Hospital’s first Aphasia Group. Initially I did not know what “Aphasia” meant. I learned “Aphasia ”is a language disability – it does not affect intelligence – it affects the language centre of my brain. I gained support from the other people in the group. I was desperate to see a Social Worker – I realised I had lost of my confidence – I was getting very attached to Peter – if he left the room I would get anxious. I knew it was not normal be so attached to my wonderful, patient husband. In February 2008 I visited Helen Townsend, a Social Worker from Maitland Hospital. Over the year I slowly regained some of my confidence. The phone continues to be something I avoid. Initially I had a bad phobia – I would not answer the phone or talk on the phone. Over 2008 I am slowly getting more confident to use the phone. I still avoid it if I can! I also had lots of speech Pathology with Rachael O’Brien at Maitland Hospital. Rachael was so encouraging and empathetic to my anxious levels! 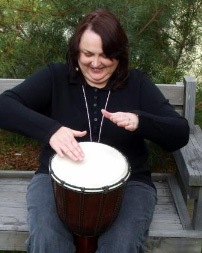 Rachael encouraged me to take up drumming for therapy. My djembe drum is one of my treasured possessions! Rachael and Kerrie Strong are my “Speechie” heroes! Kerrie is the co-ordinator of Maitland Hospital Aphasia Groups. Our group had several social get – togethers through the years. Kerrie continues to stay in touch and encourage me. Following the latest MRI in July 2008 and a visit to see Dr. Blackie in August, there was evidence that I had suffered another stroke sometime in the previous 12 months. Thankfully the stroke had been masked by my medication and I was unaware of any problem. Dr Blackie suggested some followup procedures and so on 30th September 2008 I had to present myself at the John Hunter Hospital at 8.30am for a Cerebral Angiogram. I was very anxious about the procedure – particularly the risk of a stroke during the procedure. The Registrar Doctor explained the risks, sensations that may be experienced. (Feeling a peeing sensation (?! ), risk of bleeding, unusual sensations in the brain during the procedure, and a risk of a stroke). It was “interesting” when the contrast dye was injected. I got several different reactions. I had a dizzy sensation twice, where the room swirled. I had flashes like lightening – very bright in front of eyes, I had a burning sensation in my brain, in several different sections of my head. I had to hold my breath when a film was taken. That happened throughout the operation. “Fiona, please stay VERY still”. I was asked this constantly. I tried to stay very still… I tried to meditate, keep my thoughts on pleasant things. I think it mostly worked! It all went smoothly until I started to bleed from my wound. I had a doctor pressing on my groin for 20 minutes! I didn’t know how to strike a conversation in that position!! Dr Blackie was happy with how the Angiogram proceeded. I am so grateful for the wonderful care of the hospital staff. The hospital staff were very caring and friendly – AND my wonderful husband who was beside me as much as possible. The Cerebral Angiogram results were not very different from the one I had 2 years ago (still some beading, but a slight improvement, though.) Apparently, I continue to be a mystery over my illness, one day I have Cerebral Vasculitis (CNS Vasculitis) and then the next day the Neurologist cannot confirm it one way or the other. (Cerebral Vasculitis was only diagnosed in 1995 – before that it was found by autopsy). In October 2008 at the Mater Hospital, I had a P.E.T scan (Position Emission Tomography). I had the scan because there has been evidence of tumours in the tummy following Encephalitis – Dr Blackie wanted to eliminate that possibility. The scan came back “all clear”. What a relief! wonderful confidence boost for me to visit my new friend and get acquainted. 2009 was travelling well until June! Every day I make a “real” tea in a pot. seven days. It was another “episode/flare” – swelling in the brain. During my stay in June 2009 Dr Blackie and his team felt I had to go onto a stronger medication. While in hospital I started Cyclophosphamide (A Chemotherapy drug). It was put in via a canula and gave me three hours on the drip. The nurse had to be a masked, gowned, and wear gloves to start my infusion. My thoughts were what this doing to my body? I had to go to the John Hunter Hospital for monthly infusion of Chemotherapy (6 in all). I sat in the Infusion Lounge for up to four hours. Each month I got more sick after each Infusion – at the end I was sick for six days – yuck! My hair started to fall out and over the time it got very thin. That was aside affect from the chemo drug. I was very tired over the next 6 months. When the Infusion was finished I was put on a maintenance drug (another Chemotherapy drug – Imuran). I have been very involved with the Australian Aphasia Association (http://www.aphasia.org.au). I write articles and poems that are published in the Aphasia Link (the national newsletter for members around Australia & New Zealand). In September 2010, Peter & I attended the two days of the National AAA Conference in Paddington, Sydney. I am a founding member of Maitland Hospital Aphasia Group (started in 2007). I am an “Aphasia groupie” – I attend every group! Over time I have made several friends through this group. In November 2010 I had our first Aphasia & Friends Coffee Club (I booked the venue, sent invitations etc) we met once a month. In December we were told we can’t have any more group speech therapy at Maitland Hospital as we have to allow other people the opportunity for therapy. We were very disappointed. In December 2010 I write to our local MP (Mr Frank Terenzini) about setting up an Aphasia Communication Group for people who want to continue improve with speech. I was able to have a room, free, every Wednesday for two hours. We started with four members and now in November 2011 we have nine members. All have aphasia (some mild and some severe). In September 2011 I was surprised from Maitland Hospital Speech Pathology Departmentwho nominated me for the City of Maitland City Service Award 2011! What a privilege! On 30 November 2011, the City of Maitland City Service Award 2011 I was awarded & presented to MEat the annual Council Volunteers Ceremony. I am so humbled to have this award, and hope it will spread the word about Aphasia. Now I enjoy stable health. We still play charades as Peter and I try to work out the word I am trying to find. We laugh together. Now I am in remission after two years. My hair has come back curly and most days are diamonds. I have continued to write poems as a way to express my thoughts and emotions. I took up making jewellery as a form of therapy (good for find motor skills and concentration). I try to find a joy every day. I love this life as it stands now.